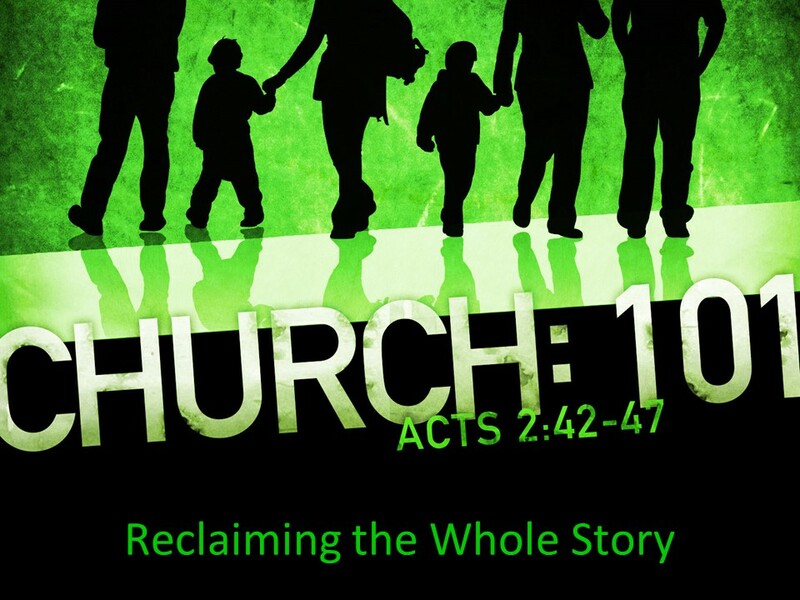 Restoration is a familiar theme for those of us who have grown up in Churches of Christ. For over 150 years we have been working the principle of restoration. And we need to continue doing so. Yet, I believe that we need to rethink restoration. The prevailing assumption that has driving restoration has been that if we can restore the FORM of New Testament Christianity (i.e. the way they did it in the 1st Century), then the FUNCTION of the 1st Century Church (i.e. their power, influence, spirit, unity, courage, hope, love, devotion, etc.) will be experienced again by us in our churches today. Over time that has led to what can only be described as an obsessive interest in forms and patterns of practice that must be scrupulously followed. And we were good at it. And we were committed to it, particularly in the areas of Worship (we have the 5 Acts of Worship - no more no less), Church Organization (A plurality of Elders and Deacons), and the Plan of Salvation (Hear, Believe, Repent, Confess, and be Baptized - by Immersion, for the right reason (forgiveness of sins), and saying the right words) and a few others items. We were so committed to this principle and the underlying assumption (Function follows Form) that any deviation or anything that sounded like an innovation, was to be rejected as unscriptural, unfaithful, and too often something that resulted in being subject to being disfellowshiped by the those who were holding to the "pattern of sound words." But the question needs to be asked, "Did searching out and restoring the Forms of the 1st Century Church result in a renewed experience of the Functions of the 1st Century Church? When I look at the overall impact of our fellowship - shrinking numbers, shrinking influence, and too often shrinking spiritual strength among our members, I have to say the answer is no. I am not saying there has been no good done among us, for there has. Multiplied thousands have become Christians through the preaching and teaching of our members, lives have been helped, good has been done around the world by us. But there is no denying we are loosing ground. And how do we stop our slide into irrelevance? What we we shifted our priority from Forms to Function? What if we instead of trying to restore forms, we focused on restoring the Function, the Mission of the church, and allowed, where there is freedom to do so, to let the forms develop naturally from the function as they are being exercised in our time and culture? What would that look like? That is what we are going to explore in the coming weeks. Most of us are familiar with John Godfrey Saxe' poem, "The Blind Men and the Elephant." It tells how 6 blind men came to have very differing opinions about what an Elephant was because they had each only experienced part of the animal and took that as the whole of it. Often our experience of church follows the same inadequacies. We often connect with only a part of the Story, and therefore our understanding of church, is going to be limited. Gabe Lyons in his book, The Next Christians describes 5 ways that Christians connect to only a part of the story in the way we interact with our current culture. Insiders are driven by a desire to maintain personal purity and faith, and we do that by withdrawing and separating from the broader culture around us. Our primary interactions are with other Christians. Culture Warriors are driven by a desire to protect and maintain cultural expressions that reflect Judea-Christian values, and are very concerned by the 'secularization' of society. Evangelizers are motivated to 'win souls for Jesus'. The world needs the message of the Gospel in order to be saved. Everything else is a distant second. These first 3 perspectives, Lyons groups under the Separatist heading. They connect with culture, but from the safety of the church as if it were an outpost - separate from the culture at large. Separatists see ourselves as "a countercultural movement that uses [doctrine] as a means of defining cultural boundaries... intended as much to alienate secular culture as to give [separatists] a sense of identity and purpose." But there are two more. These Lyons groups under the larger heading, "Culturalists". Blenders are driven by a desire to create an atmosphere of acceptance. We tend to adopt cultural expressions and ways of thinking, and adapt our churches to blend with them. Toleration is a very high value for Blenders. Philanthropists are driven by a desire to make the world a better place. We are very 'ministry' oriented and those ministries are almost exclusively in the arena of social needs; poverty, housing, clean water, medicine, etc. I'm sure that with a little thought we might find one of these to be more dominant in our understanding of what the church is supposed to be. And we can certainly find Biblical rational for each of these perspectives. The problem is, that like the blind men 'seeing' an elephant, it is only a part of the elephant. If we are only/primarily experiencing a part of the story, the reality is, we are missing the story. We need to be living the whole story. Gabe Lyons suggests a third way, not a balance of all 5 perspectives way, but an entirely different way of being Church. Restorers are engaged in the mission of God in the church. What does God intend the church to be from Pentecost to the Last Trumpet? That is the question we will explore next week. The Church is the most amazing thing in the world. It was dreamt of by Nebuchadnezzar, built by Jesus, preached by the Apostles, and empowered by the Holy Spirit. The church is the eternal purpose of God through which he intends his wisdom to be made know to creation. In it people are transformed into the household of God, the body of Christ, the temple of the Holy Spirit. It is the glorious bride of Christ for which Jesus came into the world, gave his life for on the cross, rose from the dead and is coming back for again. It is hard to imagine why anyone wouldn't want to be a part of that awe-inspiring church. And yet we know there is often a disconnect between that amazing church we read about in the New Testament and our own personal experience. We know the unsettling news that numerically, the church is in decline in America. 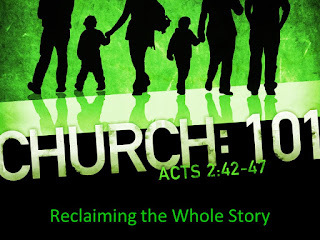 For years, we've been reading books like; Inside The Mind of Unchurched Harry & Mary (Lee Strobel), Surprising Insights From The Unchurched, and The Unchurched Nextdoor (Thom Rainer), UnChristian, and Churchless (David Kinnaman), all telling us about the rise of the unchurched population in America and how to understand them. Those who mark, "None" when asked about the religious experience are a growing population, and a growing concern for concerned Christians. But the problem isn't just out there. A number of other books reveal an unsettling trend within our own walls. Books like, Why Men Hate Going To Church (David Murrow), Why Nobody Wants To Go To Church Anymore (Thom Shultz), You Lost Me (David Kinnaman), and Why They Left (Flavil Yeakley) reveal that while the "Nones" are a growing group, so are the "Dones"; those who are leaving the church for a variety of reasons. While it's distressing, I don't think we need to hit the panic button just yet. Thomas Rainer's book, Autopsy of a Dead Church, isn't meant to distress us, but to help us avoid that becoming a reality. And the truth is, we do need to take the time to assess where we are, why, and most importantly, how to move forward in the 21st Century. Can we recapture the dream of Church - as God intended it? Yes, we don't have to be The Last Christian Generation (Josh McDowell), instead what if we could be The Next Christians (Gabe Lyons). That is what this series is about. I want to encourage you to listen to the message I preached at University on Sunday, May 31 and join us on this journey to Recapture the dream of what God intends for his church in the 21st Century.